Of that, 435 mm fell in the last week of February and the first two days of March when a rain depression was trapped over the city; an unusual but very welcome event which made the difference between another really weak Wet and a nearly-average one. However, if we get 900 mm we are still in the “dry” phase of our semi-regular swing between dry and wet periods. The present phase, as I noted two years ago, began in 2013 with a total of 715 mm; 2014 was close to average with 1037 mm, 2015 was our record low with 398 mm, 2016 was better with 951 mm but 2017 was lower again with 790 mm. Ross Dam, Townsville’s primary water storage, normally empties steadily through the Dry. This pattern is seen more clearly in a chart compiled by Mike Shearer from the chart on the Council site than on my screen shot from it, above, because Mike has taken the trouble to assemble it into one long strip – download the pdf here. 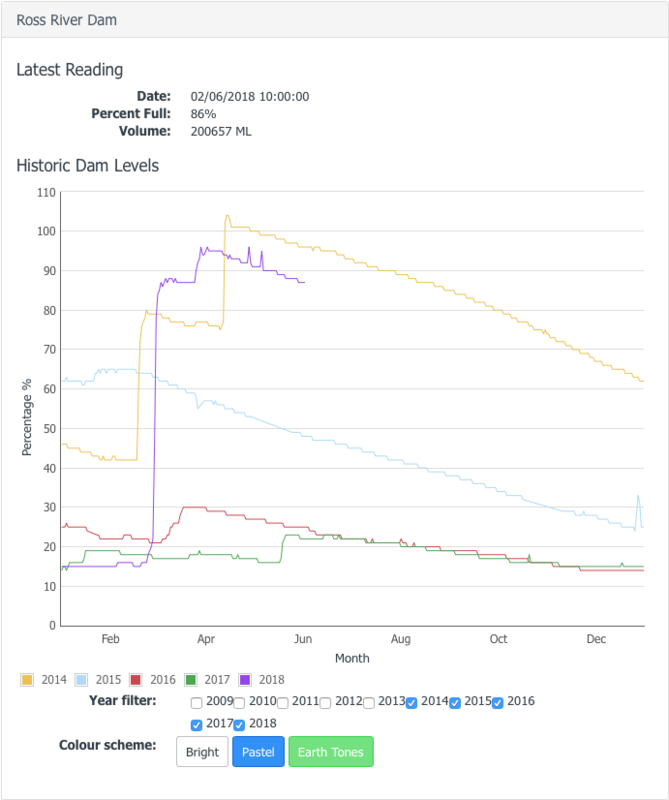 It is also apparent that the dam is usually filled, if it is filled at all, by just one or two rain events each year – Cyclones Hamish in 2009, Yasi in 2011 and Ita in 2014, with a “severe storm” in 2012 and our rain depression this year. Our recent water woes are due to the fact that we went without a dam-filling downpour for three consecutive years, 2015-17. 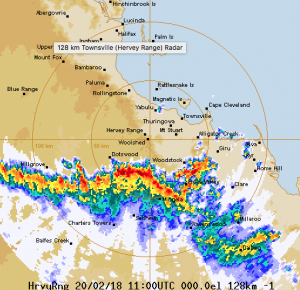 Long-time residents tend to say, “We don’t get a real Wet without a cyclone,” partly because many of our big events are rain depressions formed from the remnants of cyclones which don’t actually strike us. The biggest of these was the “Night of Noah” in 1998, which most residents remember vividly. If Ross Dam fills in the Wet, the rate of consumption is such that it would empty completely in two years – except that it never does, firstly because it refills to some extent in the next Wet and secondly because the City Council imposes ever-tighter restrictions as the level drops and then starts pumping from the Burdekin Dam. A complicating factor in all this is that the city’s population has been growing steadily, so that a water supply which was usually adequate twenty years ago now requires constant management. Even now, after the dam nearly filled two months ago, the council has us on Level 2 restrictions.